Via Designboom. The winning project page can be found here. 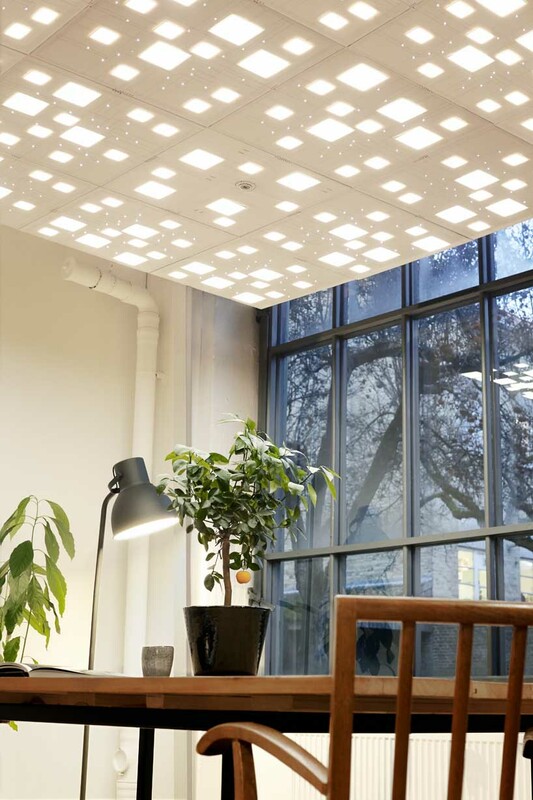 Diffus Design in partnership with Saint Gobain Research propose a combination of etextiles, LED, and OLED to create an embedded lighting concept for soft, acoustic ceiling tiles. 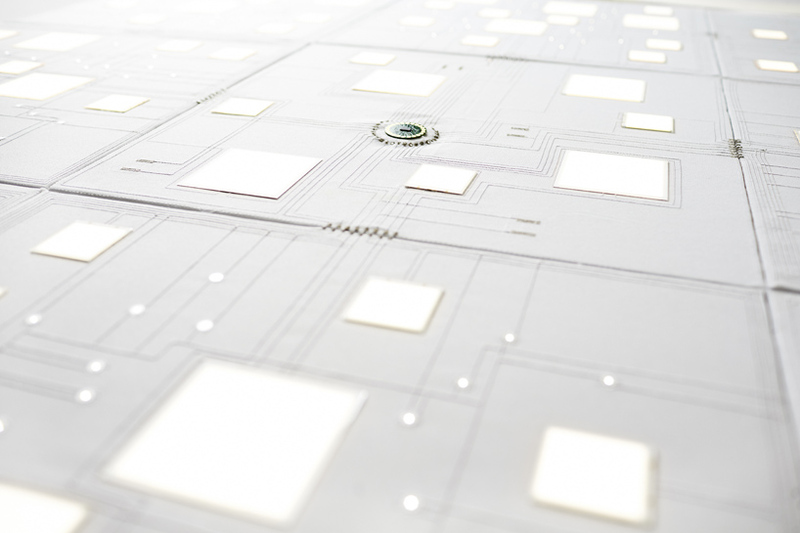 The goal of this project is to exploit the advancements of OLED and LED technology in the area of acoustic ceiling tiles. 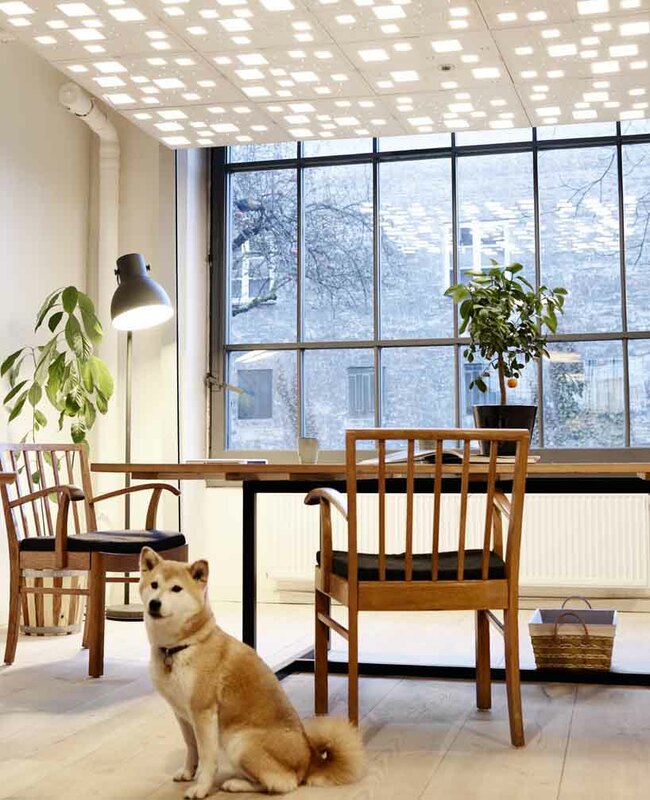 Our approach is to surface mount light and circuitry to avoid that light installations are effecting the acoustic performance and also to ease the technical installation. The traditional solution for integrating light in acoustic ceiling tiles is to remove acoustic material whenever light is wanted. 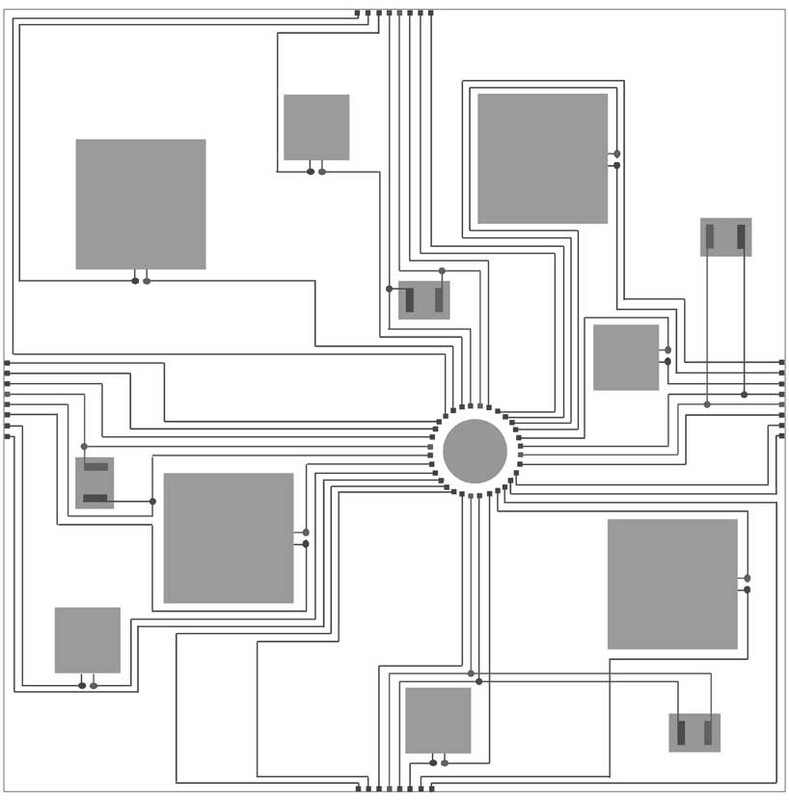 With this solution the installation process is complex and requires an electrician to establish connections from above the tiles. 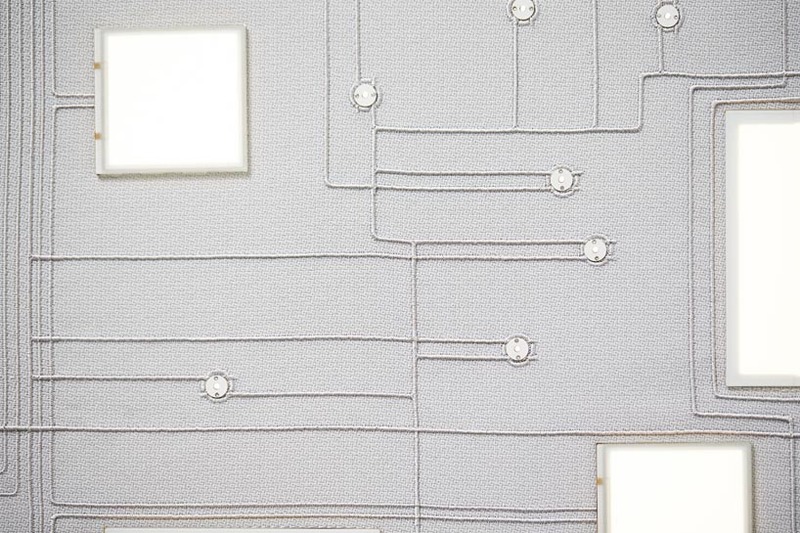 With ELAC we apply the circuitry on textile through a soft embroidery process and then mount it onto the tiles. 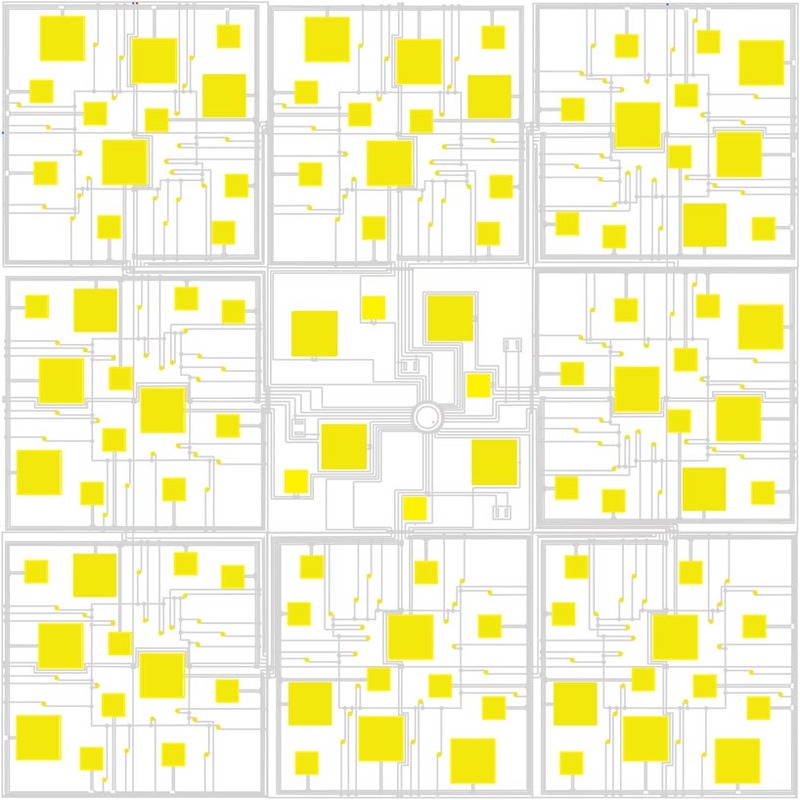 A central tile is the ‘brain’ for 8 surrounding tiles, and a multiplication of ‘islands’ of 9 tiles can be done for the light surface to become larger. 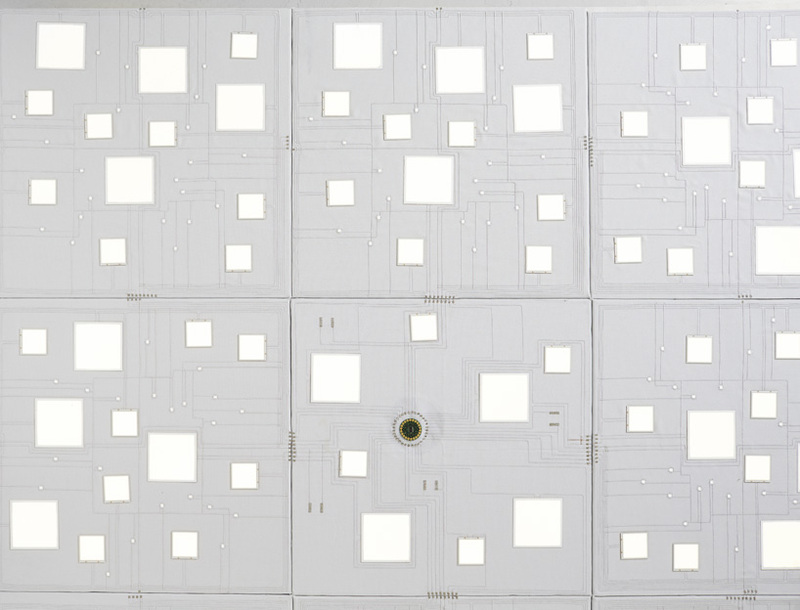 The brain tile allows wireless interaction with built-ind sensors to monitor surroundings and adapt behavior accordingly. The power and data gets transmitted from tile to tile through embroidered contact points. The precision of the sophisticated industrial embroidery allows the tiles to just touch each other and then transmit. 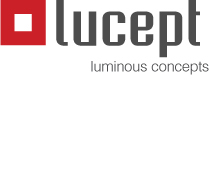 Our design demonstrates how OLEDs can compete with traditional lighting solutions in terms of lighting quality, how the potential of realtime control of LEDs and OLEDs can create individual light settings and how soft surface mounted technology can open up to new ways of integrating light. With ELAC we want to demonstrate the esthetic potential of revealing the embroidered circuitry in an interplay with OLEDS and LEDs.